Gorgeous outfit! Love this necklace handbag! Don't miss today my Comfy & Chic look....with amazing Coco&Raffia wedges and bag!!!. Love your jacket and shorts! I love your necklace and bag! You look gorgeous, Anna :) As usual. Happy Monday! the shorts are very cute! You look gorgeous as always! Love the bag and the necklace. Amazing outfit. Love your stunning necklace and the shorts are so pretty. Love that blazer and necklace!! I have been looking all over for a bag like that. I feel like they used to be everywhere and now that I want one they have gone missing! Also, I love your striped blazer. Those shorts are so adorable! I love the two-tone lace! Gorgeous! Love this outfit, especially that bag!! As if I needed another reason to love stripes...I'm obsessed with this blazer!! I love the mix of prints!!! Super cute blog post!! Such a great outfit! Love the bag! Cute outfit. Love the mixed prints together. I would love it if you stopped by and entered my 2 giveaways: Henri Lou Bracelet and one from Gigglosophy. Also don't forget to link up for my weekly link up this Thursday. I neeeeeed those rachel by rachel roy shorts-- NOW! So chic! That is such an awesome necklace! LOOOVE the neckalce and orange bag, so pretty girl! You always wear such gorgeous colors, I love that, so cheerful outfits! Love your necklace so pretty! Those shorts and that handbag is darling!! 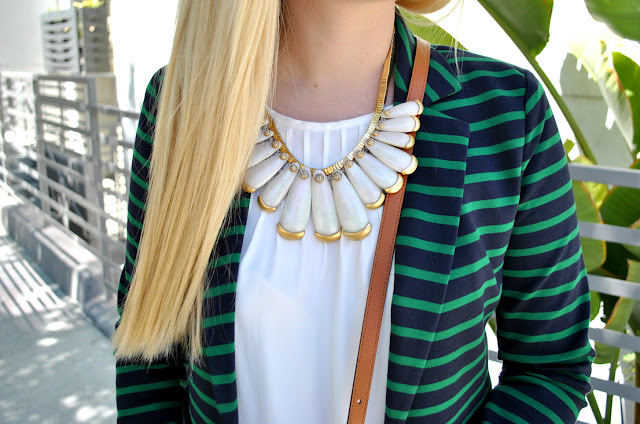 Love that big chunky necklace with the striped blazer! I never would have thought to put that blazer and those shorts together, but I love it! Those lace shorts are my fave! I love the color! Very cute outfit, love it! also, i absolutely love the picture of the long-lashed girl in your logo. love ur blazer n necklace!! 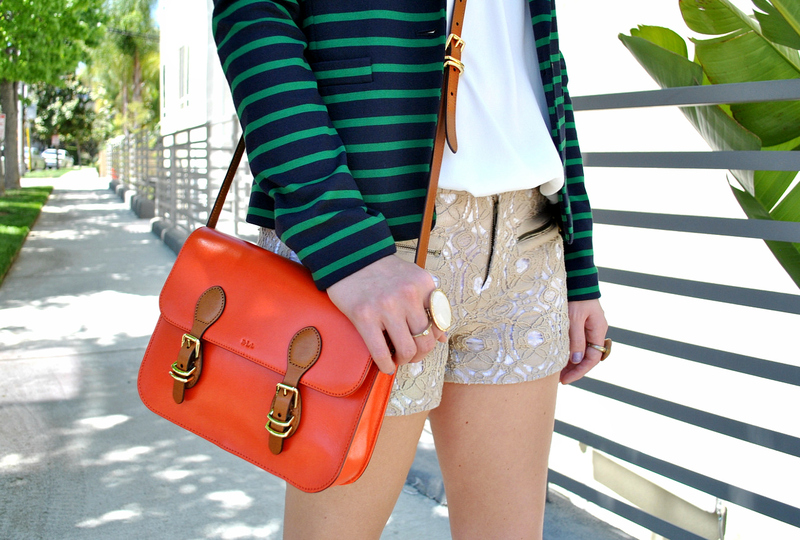 I love romantic shorts with striped jacket! Gorgeous! Love the funky necklace and the funky colors of your blazer. Very cute! Great blazer! Love the heels too! Love the striped blazer and the bright bag! Such a cute look! That blazer is gorgggggg. Obsessed. Love the detailing in your shorts, xoxo. ou that bag is super duper gorg!